Thank you for visiting Mary Davidsaver's website. 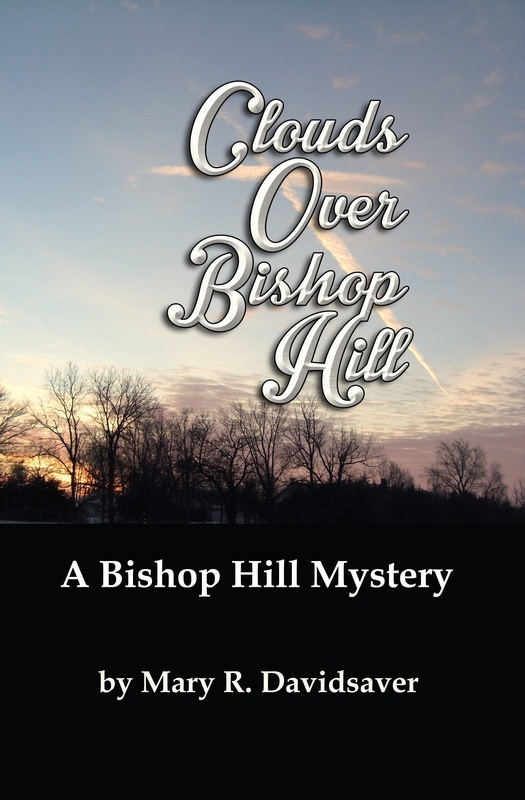 This is the place to find the latest news about Mary and the new cozy mystery Clouds Over Bishop Hill. ​You may connect with Mary by email or through her Facebook author's page. Clouds Over Bishop Hill is a cozy mystery unfolding in a Bishop Hill that is both familiar and unfamiliar to those who have visited the Illinois state historic site. This Bishop Hill is a small town lacking in windmills but packed with intrigue as Shelley Anderson, a young Knox grad, is pressed into finding Olof Krans's last portrait, a painting that has been hidden away for over ninety years. A cloudy cross in the early morning sky and a half-remembered dream jog the memory of an elderly woman and sends her off in a stolen minivan straight into the path of Shelley. Shelley has her return home to Bishop Hill interrupted by the near collision and the discovery of the body of a well-liked woodworker. Centenarians make poor detectives, so it is up to the younger generation to continue the mission to recover the painting. Shelley pounds the brick sidewalks of Bishop Hill as she navigates between museums and restaurants trying to determine if the old woman's dreams are real or not. If there is a painting to be found, how dangerous will it be to actually discover it? After all, it had to have been hidden for a good reason in the first place. Clouds Over Bishop Hill by Mary Davidsaver offers the reader a look into a not-your-average small town. She spins history into an entertaining mystery with present day relevance. Bishop Hill, after all, is in Illinois, a state undergoing an epic struggle to keep things like museums open and functioning. Clouds Over Bishop Hill is available in paperback and Kindle edition at Amazon.com. Use the button below for a quick link. Check out EVENTS for the list of appearances. Come to a reading or book signing. I love mysteries, all types of mysteries but the ones I am passionate about are the ones that harken back to the English mysteries – like Agatha Christie. This book is like one of those mysteries only with a modern spin. I LOVED it. Scribble Nov. 19th at NOON! My interview about COBH was #106 for Don Wooten and Roald Tweet. Scribble is on WVIK at noon every Saturday: a collection of conversations, comments, and reviews of reading, writing, editing, publishing, and selling books. Mary loves getting feedback from readers. Send questions, suggestions, or just your thoughts to mary@marydavidsaver.com or by using the following form. The BEST source for up-to-date news. ﻿Information about books and writing. Sep 28: Agricultural Days in Bishop Hill. I will be at the Prairie Arts Center, 203 Bishop Hill St, from 11 am-4 pm. Nov 30: Christmas Market in Bishop Hill. I will be in the Prairie Arts Center, 203 Bishop Hill St, from 11 am-4 pm. Dec 7: Christmas Market in Bishop Hill. I will be in the Prairie Arts Center, 203 Bishop Hill St, from 11 am-4 pm. Mary Davidsaver is a graduate of the University of Iowa who lived in Bishop Hill, an Illinois state historic site and a national historic landmark for twenty-four years. She wrote for local newspapers and won an Illinois Press Association first place feature photo award. Since returning to Iowa she has won two Iron Pen first place awards, was the first local writer to win the Great River Writer's Retreat contest, and was honored as an Outstanding Literary Artist by the Midwest Writing Center.